Emilia-Romagna is a region in Northern Italy that extends inland westward from the Adriatic coast. One of the most beautiful and unspoilt regions of Italy is the area of Tuscan Romagna, roughly between Forli and Florence. Hilltop towns and villages like Castro Caro Terme, Bagno di Romagna, Modigliana, Portico di Romagna, Rocca di San Casciano, Tredozio are delightful discoveries. In Romagna, along the Tuscan border is the Parco del Casentino, a protected reserve, the most important woodlands in the Appennine Mountains. Riviera Adriatica - the coastline filled with beach towns catering mainly to the younger visitors. During the 2nd century a Roman road was built that connected Rimini to Piacenza. Built in honor of the Roman consul Mark Emilio Facetious, it was called Aemilia. The region is named after this road and defined by it: all the important cities, with the exception of Ferrara and Ravenna, are actually on the Via Emilia. In the 6th century the Romans lost this territory, which was divided between the Longobards and the Byzantines ( Eastern Roman Empire), and the territories were named Longobardia and Romania respectively. 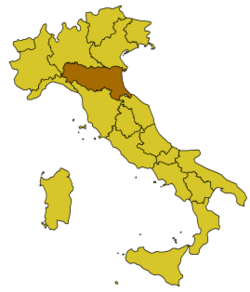 With the unity of Italy, the Region acquired the original Roman name of Emilia, and it was only in 1947 that the name of Emilia-Romagna was assigned. Emilia-Romagna is a region of gentle hills between the River Po and the Appennines, sloping gently down to the Adriatic in the east. As elsewhere in the Po Basin, intensive agriculture is pursued alongside small and medium industry. During the summer months the miles and miles of sandy beaches on the Adriatic coast are a mecca for Italian tourists, and are also particularly popular with Northern and Eastern Europeans. The are many local dialects and each town has its own distinctive accent and vocabulary. Bolognese is very different from Forlivese which is different from the Romagnolo of the coast, which is different again from the Romagnolo of the Appenine mountains. In Emilia, Parma and Modena may be close together but the dialects spoken are far from identical. There are international airports in Rimini, Bologna, Parma, outside Milan called Linate, and nearby Ancona. Trains and roads run the length of the Po river to the coast from Milan, linking the airports and the resorts. Many of the larger cities like Parma, Bologna, Forlì, for example, have bus service into the countryside. Bologna is a major train station with Eurostar, as is Rimini. If you can, rent a car and take any of the many roads that branch off the Autostrada and head south into the Alpennine Mountains where you will find hot spring spas, ancient castles protecting mountain passes (don't miss Castello Torrechiara, near Parma). Side note: While taking the train south from Milan, don't forget to catch a glimpse of the Domo perched above Bologna in the south. It is especially interesting at sunset. The region is famed for its culinary delights, especially the fine gold coloured egg pastas like Tortellini and Tagliatelle and the green Lasagne Verdi all from Bologna. Gramigna is another Bologna pasta, then there are Garganelli from Imola, Cappelletti and Passatelli from Reggio Emilia and Anolini from Piacenza. Ricotta and greens filled Tortelli are served throughout both Emilia and Romagna. Bologna is also famous for its Ragù known in English as Bolognese sauce (which is *never* served on Spaghetti) and for fragrant Mortadella (centuries old and noble Italian ancestor of the unpleasant present day Oscar Meyer). Parmigiano Reggiano cheese is made in a large part of Emilia starting with Bologna itself and ranging North and West through to Modena, Reggio Emilia and Parma. "Parmigiano Reggiano" was originally made only with the superior quality milk obtained from the red coated cows of Reggio Emilia, called Razza Reggiana in Italian. Parmigiano Reggiano is at its best when it has been aged for between 24 and 30 months. The cheese made with the milk of the red cows ages even longer and is excellent at 36 months. The region also produces cured hams including, besides the famous Prosciutto di Parma, other excellent products like Prosciutto di Modena and Culatello di Zibello. Piacenza is famed for its coppa, salame and pancetta, Modena for its Zampone and Cotechino. Cured pork products like Lardo, Guanciale, Salame and Pancetta made from the ancient Mora Romagnola breed of pig are the pride of Romagna.. The original Balsamic vinegar Aceto Balsamico Tradizionale is produced only in this region, in the neighbouring towns of Modena and Reggio Emilia. It is made exclusively of cooked down pressed grape juice and has to be aged for a minimum 12 years in wooden barrels before being bottled. The word "tradizionale" is essential on the label. The Balsamic Vinegar which is not Tradizionale is made only of the very cheap ingredients of vinegar and sugar. In Emilia (everywhere west and north of Bologna from Modena to Piacenza) the favourite wine to drink with all the rich local specialities is Lambrusco: tart, dry and worlds away from the sickly export version. Also appreciated is Piacenza's red Gutturnio, a blend of Bonarda and Barbera grapes. Whites in Emilia include cool Sauvignons and sparkling wines made from the aromatic Malvasia grape. Both make fine "food wines" ie wines to go with food. Much of the best of this region's wine comes from Romagna (everywhere south and east of Bologna), where the whole area makes superb Sangiovese di Romagna. These wines make for fine drinking at bargain prices, considering the grape is the same as the that used for Chianti but sells at a fraction of the price. Many top producers ( from Imola, Forli, Faenza and Ravenna, to name but a few of the wine areas) have for years been winning top prizes both nationally and internationally for their excellent Sangiovese di Romagna wines. Veneto lies directly north. South along the coast is Marche, with the tiny state of San Marino. Tuscany with Florence lies over the mountains to the south. Liguria can be reached over the mountains to the southwest. Lombardy with Milan then Piedmont are to the west. On the east is the region's Adriatic coast. This page was last edited on 6 January 2017, at 10:11.